Woody Allen has long boasted about his disinterest in pop culture, explaining that he'd rather work on a screenplay or watch a Knicks game than engage with current films or television. That said, there is at least one television show that has caught his attention in the last few years — Hannah Montana. In a new interview with The Hollywood Reporter, Allen opened up about his regretful upcoming Amazon series. 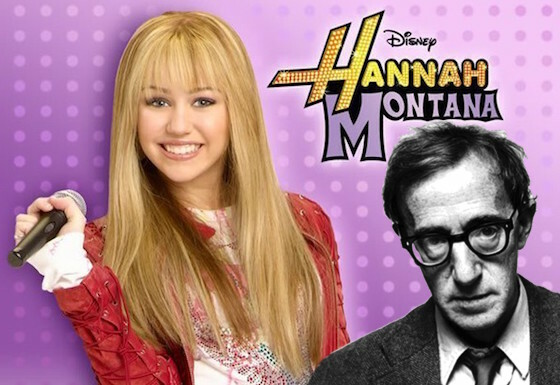 Alongside Allen and Elaine May, the project stars Miley Cyrus, and Allen explained that he first got into Cyrus through seeing her hit Disney TV show. "I noticed years ago that my kids would be watching Hannah Montana," Allen recalled. "And I would say: 'Who is that girl? She's got such a good delivery. You know, she snaps those lines off so well. The show is a silly little show, but she's very good at what she does.'" Later, he was reintroduced to Cyrus through her musical performances. "And then she emerged as a singer, and someone showed me a little clip of hers from Saturday Night Live, and I said, 'It confirms what I always thought about her: She is very good, she is really a talented girl.' She wanted to take some time off, but she [agreed to do the series] because the role interested her." Cyrus wasn't the only young woman that Allen discussed in the lengthy piece. He also opened up about his long, controversial relationship with Soon-Yi Previn — the adopted daughter of his ex, Mia Farrow. She had a very, very difficult upbringing in Korea: She was an orphan on the streets, living out of trash cans and starving as a 6-year-old. And she was picked up and put in an orphanage. And so I've been able to really make her life better. I provided her with enormous opportunities, and she has sparked to them. She's educated herself and has tons of friends and children and got a college degree and went to graduate school, and she has traveled all over with me now. She's very sophisticated and has been to all the great capitals of Europe. She has just become a different person. So the contributions I've made to her life have given me more pleasure than all my films. Woody Allen's next film Cafe Society is set to debut at Cannes later this month.